Posted on August 26, 2014 August 30, 2015 by SherylPosted in Food, recipesTagged bread, crab apple, muffins. I love the sound of this recipe! And we’ll have crab apples soon . . . I think that you’d like it. My husband and I finished the crab apple muffins that I made when I took this photo tonight–and he said that I should make some more soon. This will be a good recipe to have when our crab apples ripen. Making jelly with them all the time gets a bit boring. I’ve enjoyed trying various crab apple recipes over the past few years. It you like crab apples you may also want to try the Spiced Crab Apple and Crab Apple Chutney recipes that I posted in previous years. Yes, I had a look at those. They look delicious. I am keen to try them too. We won’t see any crab apples till about April or May 2015. We had your cobbler again this week. It is a firm favourite! I’m a little jealous that spring is just arriving in New Zealand. The days are getting decidedly shorter here–and it’s starting to feel a bit like autumn. It’s nice to hear that the cobbler has become a favorite recipe. Sounds like your grandmother is in a post vacation funk! I agree!. . . though I’m hoping that she’ just distracted. I’ve never made anything with crabapples, but there are plenty around right now so this just might be the time to try the recipe. You should try cooking with them. They have a nice tart taste. I don’t remember anyone in the family ever making anything with crabapples. We kids just threw them at one another. We never hurt each other, but we sure had fun! I love tarty, fruity desserts! We had a crab apple tree when I was growing up. I remember it being messy and if you weren’t careful you would go sliding on the crab apples that fell to the ground. 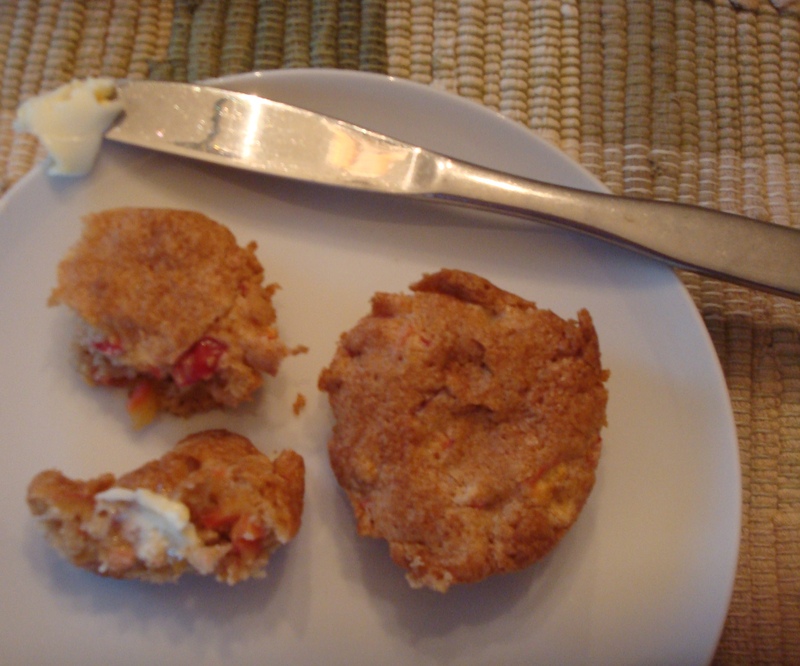 But I never had crab apple muffins! I have the best of all worlds. The crab apple tree (and thus the mess) is in a friend’s yard. She gives me some crab apples each year, but I don’t have to deal with the mess. I just tried these because our crabapple tree is loaded this year. So far we have taken off over 100 lbs of crabapples and we are only about 1/5 done 😦 These were really good – I just wish they used more crabapples 🙂 I will definitely make them again – I especially like the use of brown sugar in the recipe. Yummy! Wow, your tree sure must be loaded with crab apples. It’s wonderful to hear that you enjoyed this recipe. These are great! I like the contrast of the sweet batter with the tart apples. I made them gluten-free, using 3 or 4 different flours, and they still tasted good! I’m glad you liked it. Thanks for taking a moment to tell me about how you adapted the recipe. It’s wonderful to know that this recipe works well with a variety of flours.